There’s nothing stopping your tough and beautiful mandevillas as they scramble up the brightest trellis in the garden — that’s why these plants are such favorites with gardeners! Easy and carefree, these vines rarely fail; when they do, it is often because of the few insect pests of mandevilla. 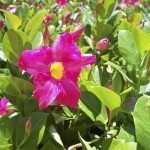 Read on to better understand mandevilla bug infestations and cures. Mandevilla vines are tough plants, but even they are subject to a few pest insects that can cause real problems. Bugs on mandevilla vine are easy to treat if they’re caught early, but you’ll have to keep a close eye out for them since these insects often remain well-hidden. Mealybugs leave small piles of waxy debris on the branch crotches of mandevilla vines, feeding nearby or on the undersides of leaves. These pests produce copious amounts of honeydew as the pests feed on plant juices, causing leaves below feeding sites to appear sticky or shiny. Ants may cluster near these sites, collecting the honeydew and defending the mealybugs from harm. Spray your plant with insecticidal soap and recheck it often for signs of mealybugs. If leaves continue to yellow and drop, you may need to spray your plant weekly to destroy new mealybugs as they emerge from their waxy egg sacs. 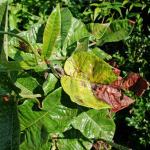 Scale insects are the most difficult of the mandevilla pests; they are experts at camouflage, often appearing as irregular growths or waxy deposits on stems and leaves. Some scale produce honeydew, like mealybugs, but insecticidal soaps will rarely take them out due to their hard coverings. 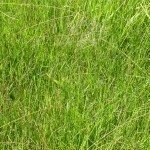 Neem oil is the spray of choice for scale, and weekly spray treatments are the norm. If you notice the scale bugs are changing colors or your plant begins to recover, lift some of the scales’ hard covers to check for signs of life. Spider mites are usually difficult to see with the naked eye, but their damage is unmistakable — individual leaves are suddenly covered in tiny, yellow dots that may grow together before the leaf dries and falls off the plant. Spider mites also weave fine strands of silk where they’re feeding, which can aid in your decision to treat them. Spider mites are attracted to dusty conditions, so if your plant isn’t too punky, start by spraying down any dry spots and cleaning the dust off your plant’s leaves, especially indoors. If spider mites persist, insecticidal soap or neem oil are recommended. 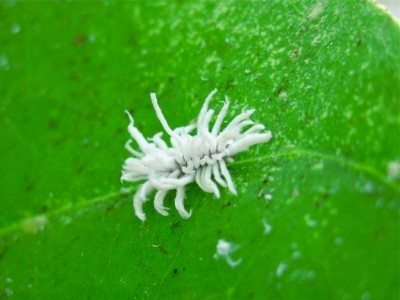 Whiteflies are tiny, moth-like insects that congregate in large groups on the undersides of leaves. They cause similar damage to mealybugs, stressing leaves until they drop, but are extremely visible and easy to identify. 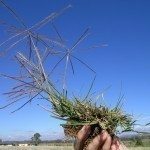 You may notice tiny white insects flying up when you bump your plant or walk too close; check the plant carefully for feeding sites when it starts to look unwell. Whiteflies drown easily, so they can usually be cured with regular sprays from a garden hose.